Clemson football is a major brand name, especially across the South. As such, it’s no surprise that Clemson does so well pulling top rated recruits out of cities like Atlanta and Jacksonville. 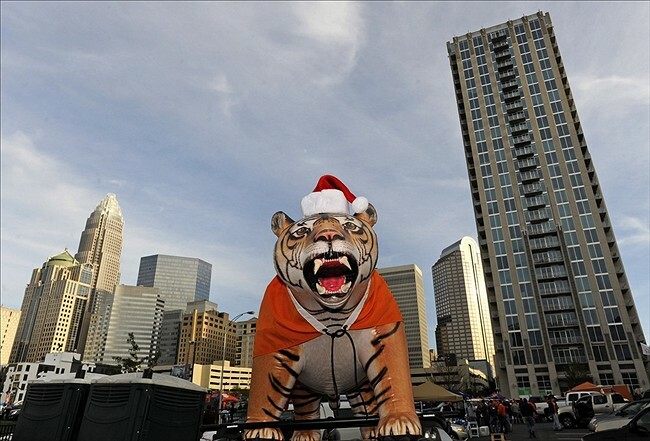 What draws lamentations though, is Clemson’s inability to do so in Charlotte, NC. Clemson’s campus is located a mere two hours from Charlotte, closer than any other school in a “Power Five” conference except Wake Forest and South Carolina. As such, many Clemson fans feel Clemson is missing a tremendous opportunity. How tremendous is that opportunity? We’ll focus on hard data from the 2009 to 2014 recruiting classes to find out. We look exclusively at these elite recruits because we can assume any college football program would be interested in the majority of them, given the average rating for even the best recruiting class is less than 4.00 (Alabama had the highest average star rating in 2014 at 3.92). 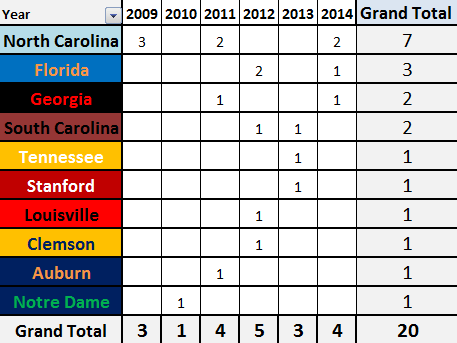 As you can see in the table above, Charlotte has only produced 20 four or five-star college football recruits in the past six recruiting cycles. Therefore, even if a University were to dominate the area and get over 50% of the top recruits, it would only amount to about two recruits per cycle on average. Not exactly a tremendous opportunity, though nothing to ignore. To further dig into the data, I organized it by the recruit’s destination school (where they enrolled out of high school) and by high school graduating class. Below, you’ll see that each row represents a university (ranked by recruits landed) with the sum of four or five-star recruits from the Charlotte metro across this six year window shown in large font on the far right. Each column represents a high school graduating class. 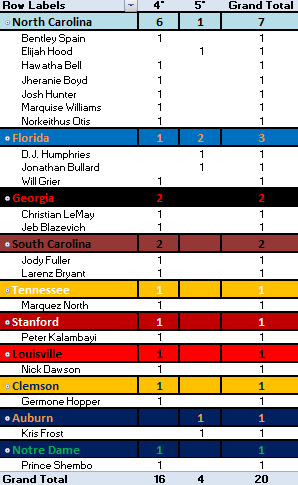 North Carolina, Florida, Georgia, and South Carolina were the only schools to pull multiple of these elite recruits to their program in this time frame. North Carolina did the best job, as you can see the they signed seven, including three in 2009. Those seven recruits North Carolina signed represent an impressive 35% (7/20) of the top recruits from the area. This is enough to make fans of other nearby schools shutter with envy. South Carolina and Clemson, both of which are closer to Charlotte than Chapel Hill and are more prominent football programs, combined to land only three recruits. Now to dig a little deeper, we look at each recruit by name, position, and star rating. The columns are (from left to right): destination school, Rivals 4* recruits, Rivals 5* recruits, and the sum of 4* and 5* recruits. With all the detailed information now presented, we see that Germone Hopper is the lone elite Charlotte recruit from this window who signed with Clemson University. He redshirted 2012 and didn’t make a big impact in 2013. He also missed part of Spring Camp due to academic issues. Although one could parse through and pick out “busts,” it is not a sound logical endeavor because it supposes that elite recruits from Charlotte are not as good as elite recruits from other places. With a sample of just 20 players, this is unfair conjecture. Furthermore it fails to consider that players from other cities may be more likely to go to schools with better coaching staffs. It is best to trust the expert evaluations and assume an unspecified four or five-star will more often than not be better than a lesser rated recruit. The above table also breaks out the star ratings to separate the four and five-star recruits. Of the four five-star recruits, three went to SEC schools. Again, this is a small sample size, but if you’re a Clemson fan you’d like to do better. Overall, we see that Charlotte does not produce a tremendous amount of elite prospects on an annual basis. 3.33 per cycle was the average for the six year window inspected. That said, no one school has dominated the area, though Florida has pulled two of the four five-star prospects while North Carolina has pulled six of the 16 four-star prospects. Finally, we see Clemson has pulled just one elite recruit from the area, so while the opportunity may not be as huge as many have lamented, it is hard to deny the data which loudly proclaims that Clemson is not succeeding in pulling the elite college football recruits from the Charlotte metro area. You got someone in Wake? That’s pretty cool. I’m living in Winston-Salem currently. Greetings Ryan. I usually read your posts on STS. You actually made me pay attention to CU Basket Ball this year. Saved this site to my “Football Favorites”. I’ve been out of pocket for most of the Summer. Please condense the Georgia game suspensions, and what the heck happened to Dr. B? Additionally, you would think Charlotte would be a no-brainer for CU, and vise versa. Yeah, this post was meant to put some data around the Charlotte recruiting discussion. It’s not as big of an opportunity as many have suggested, but we’re doing poorly, which to your point is surprising. Thank you for the kind words about our basketball posts. Comments like that are the primary reason we do it. OG David Beasley and OT Shaq Anthony are suspended. The OL is already shaky so that puts a lot of pressure on Eric Mac Lain and Joe Gore to produce. if not, Cole Stoudt is in for a long day. Frankly, even after they return from suspension we need Mac Lain and Gore to do some work or we won’t have enough depth to get through the season. Senior DE Corey Crawford is out vs. UGA, but with the depth on the DL it’s not a big deal. Garry Peters is also out, but he is probably the fourth CB and UGA is going to pound the ball so that’s not a huge deal. I can’t speak to the specific details about DrB being removed from the editorial position, but I will just say I am thrilled with Brian Goodison taking the role.